The Wordfinders programs detail the development of a Scrabble wordfinder: I initially came out with a simple program and ended up with a DCOM version (a version that demonstrates the practical [or not so practical] use of COM+ for Windows 98 and higher). When starting out on these programs I had no basic knowledge of using algorithms like DAWG. It wasn’t until I discovered Graham Toal’s excellent Word Games site when I became aware of the fact that my approach (while fast) was literally a ‘brute force approach’. Still, the ‘engine’ is faster than the Database based versions you find around on the Internet and doesn’t require you to install a legacy database wrapper. Also, after learning of DAWG, I thought it was highly appropriate to release the source code of the Tilesetter program as one approach to tackle words. Compatibility note: All applications run on Windows 98, 2000, XP and Vista. Without a doubt you should also be able to run this on your Wine-Enabled Linux flavour. Wordfinder (version 1.6) is the simpliest version. . Wordfinder was conceived in 2000 and fitted the need for quick lookup of words. The finder comes with a TWL98 compatible library, but since this file is in plain ‘TXT’ format, you can literally use any file. 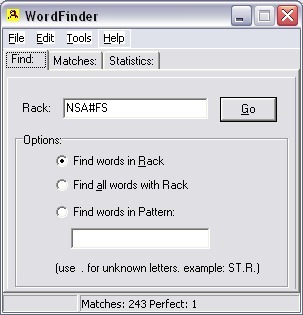 In later versions of Wordfinder I added a ‘Wizard’ to refine the ‘found’ matches and basic sorting. I’m not sure if these extra features were actually helpful. I wouldn’t be surprised if nobody used them. Note that ‘blanks’ are represented by ‘#’ signs. 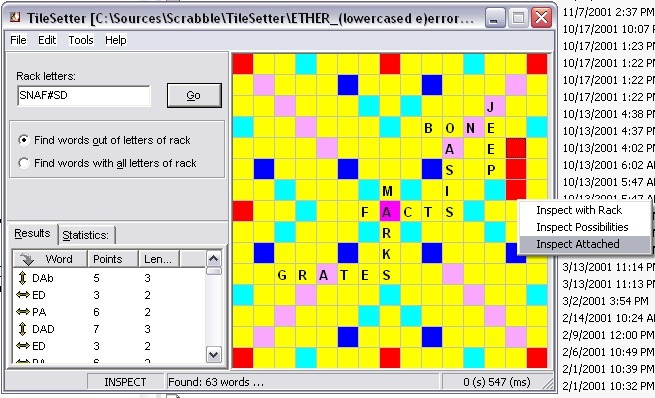 TileSetter (version 2.2) is sometimes described as WordFinder with a ‘Scrabble board': the main difference between TileSetter and WordFinder is that (if used right) it can actually help you place words in the right spots for the maximum points, thanks to the ‘Find attached words’ routines. To use these extra features, import a Scrabble board, put the program in ‘Tool Mode’ (TOOLS | Edit Mode) and right click anywere. Once again, blanks are represented as ‘#’s (or *). TileSetter’s sources are GPL-ed. You may wish to check the Gnu GPL site, before downloading the sources. Not satisfied with certain aspects of TileSetter, I decided to make a COM/DCOM object out of the main ‘Find Words’ routines. Note: installation of DCOM applications (particularly concerning rights, permissions and security) is a particularly complex procedure and requires advanced knowledge of Windows. Feel free to experiment with the instructions in the documentation (both in DOC [includes example calls from within VBA] and RTF format). The essence of this application was mainly to make a working example of a DCOM server/clients. It works, trust me. TileSettled’s sources are GPL-ed. You may wish to check the Gnu GPL site, before downloading the sources. TileSettled 2.0, comes with both client and server, (brief) documentation (DOC/RTF) and typelibrary. I’ve been playing around with DAWG. I may consider doing a rewrite.